The idiopathic inflammatory myopathies (IIMs) are a heterogeneous group of rare chronic autoimmune diseases that include polymyositis and dermatomyositis. Antisynthetase (AS) syndrome is recognised as a subset of the IIMs with a relatively homogeneous clinical profile. Differentiating between AS syndrome and infections poses a great challenge, particularly during early stages of the disease process. We report a clinical challenge of this kind. 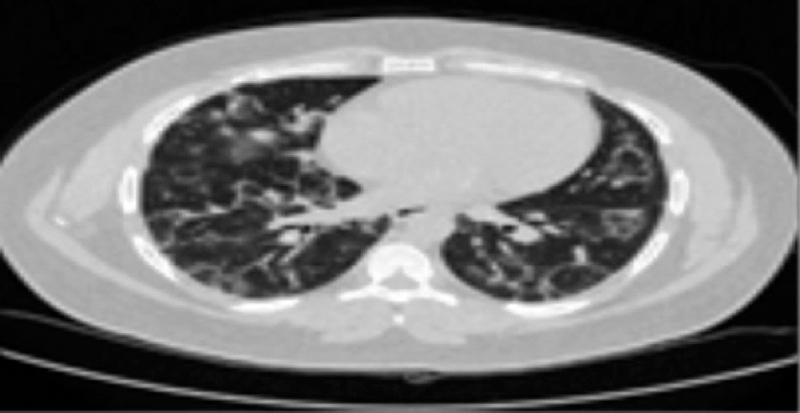 A 31-year-old Egyptian male presented with dry cough and worsening shortness of breath. He had experienced the abrupt onset of a fever that had persisted for 2 months. He reported the presence of pain and stiffness in the small joints of the hands, wrist and feet and cracked and rough skin was present on his fingers. He had been investigated previously at another hospital for viral, bacterial and atypical chest infections and found to be positive for mycoplasma immunoglobulin M (IgM) and was treated with broad-spectrum antibiotics including fluoroquinolone, but without response. He was then transferred to our hospital for a second opinion. He was a non-smoker, had no known allergies and his medical history was unremarkable. Physical examination revealed a temperature of 38°C, oxygen saturation of 94% (on room air) and blood pressure of 120/70 mmHg. Examination of the hands revealed hyperkeratosis, fissuring of the skin at the fingertips and ragged areas around the nailfolds [Figure 1]. Musculoskeletal examination revealed metacarpophalangeal joint synovitis in the hands and wrists and normal strength in all muscle groups. Chest auscultation revealed bibasilar crackles. Cardiovascular, abdominal and neurological system examinations were unremarkable. Further examination revealed an erythrocyte sedimentation rate of 30 mm/h (normal range 0–20 mm/h), C-reactive protein 68 mg/L (normal range 0–10 mg/L) and creatine kinase 3116 U/L (normal range 30–200 U/L). Full blood count, renal and liver profiles, serum ferritin levels and angiotensin-converting enzyme levels were normal. Urinalysis, hepatitis serology and complement levels were unremarkable. Autoimmune screening was strongly positive for anti-Ro/SSA and anti-Jo-1 antibodies. Other serological tests, including tests for rheumatoid factors, anti-cyclic citrullinated peptide antibodies, antinuclear antibodies, the rest of the anti-extractable nuclear antigen panel and antineutrophil cytoplasmic antibodies, were negative. Serology for mycoplasma IgM was positive. 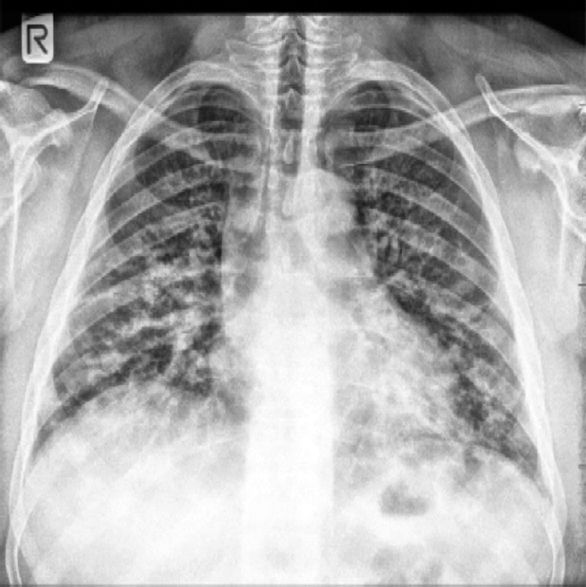 Chest radiography revealed bilateral patchy pneumonitis [Figure 2]. High-resolution computed tomography (HRCT) of the chest revealed bilateral basal patchy consolidation, a few nodular lesions and ground-glass opacity [Figure 3]. Overall appearances were most consistent with nonspecific interstitial pneumonitis (NSIP). Echocardiography was normal. Pulmonary function tests (PFTs) revealed a restrictive pattern with reduced forced vital capacity and diffusing capacity of the lungs for carbon monoxide. Electromyography revealed a myopathic pattern. Nailfold video capillaroscopy (NVC) revealed dilated capillary loops, avascular areas and decreased capillary density [Figure 4]. Based on clinical features and investigations, the patient was diagnosed with AS syndrome and showed a dramatic improvement on high-dose steroids and mycophenolate mofetil. AS syndrome is a rare idiopathic inflammatory myopathy that involves a constellation of symptoms including interstitial lung disease (ILD), myositis, 'mechanic's hands', Raynaud's disease, fever and polyarthritis. In the presence of these clinical features, diagnosis can be confirmed based on the presence of specific autoantibodies against aminoacyl-tRNA synthetase (ARS)., Human proteins are composed of 20 different amino acids, and a specific ARS enzyme catalyses the formation of aminoacyl-tRNA from each amino acid and its cognate tRNA. Therefore, there are potentially 20 types of anti-ARS antibodies. 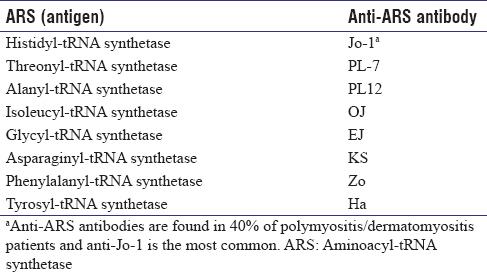 Eight types of anti-ARS antibodies have been identified so far [Table 1]., Most laboratories do not have the ability to test for known anti-ARS antibodies other than anti-Jo-1. Anti-ARS antibodies are markers of disease. Disease activity may correlate with the level of antibody. AS syndrome was first described as a unique clinical entity by Marguerie et al. in 1990. The disease typically affects adult Caucasian women, with a female-to-male ratio of 2:1. Pulmonary involvement is the leading cause of morbidity and mortality.,, The cause is unknown, but environmental triggers such as infections in genetically susceptible individuals have been postulated. In this case, mycoplasma infection may have been a triggering factor. The proposed diagnostic criteria of AS syndrome are the presence of anti-ARS antibodies plus two major criteria or one major and two minor criteria. Polymyositis or dermatomyositis in accordance with the Bohan and Peter criteria. AS syndrome is heterogeneous in clinical manifestation and can present with a variety of clinical feature as shown in [Table 2]. Treatment and prognosis in AS syndrome depend on the severity of ILD. The response to immunosuppressive medications is generally favourable. A combination of glucocorticoids and a steroid-sparing agent (usually mycophenolate or azathioprine), is initially used in AS syndrome-related ILD of mild-to-moderate severity. Rituximab has been used with moderate success for patients who are not responsive to aggressive conventional therapy.,, Cyclophosphamide is used for severe or rapidly progressive ILD. Our case is unique in that the patient was positive for mycoplasma IgM, which could be a triggering factor for the disease, and anti-Ro/SSA was also strongly positive, which is associated with more severe pulmonary disease. Mechanic's hands, which occurs in ≈ 20% of cases, was an important clue for the diagnosis, and biochemical myositis with raised creatine phosphokinase without clinical features of myositis emphasised the need to search for subclinical myositis. Microvascular abnormalities on NVC mirror the state of microcirculation in the other, deeply seated organs. Cojocaru M, Cojocaru IM, Chicos B. New insights into antisynthetase syndrome. Maedica (Buchar) 2016;11:130-5. Katzap E, Barilla-LaBarca ML, Marder G. Antisynthetase syndrome. Curr Rheumatol Rep 2011;13:175-81. Solomon J, Swigris JJ, Brown KK. 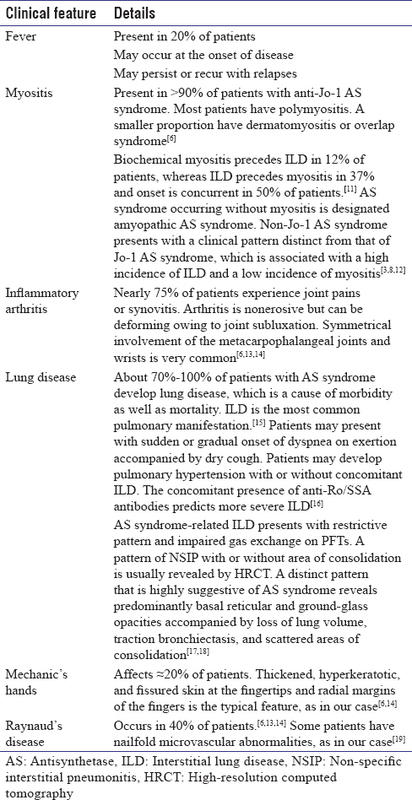 Myositis-related interstitial lung disease and antisynthetase syndrome. J Bras Pneumol 2011;37:100-9. Stone KB, Oddis CV, Fertig N, Katsumata Y, Lucas M, Vogt M, et al. Anti-Jo-1 antibody levels correlate with disease activity in idiopathic inflammatory myopathy. Arthritis Rheum 2007;56:3125-31. Marguerie C, Bunn CC, Beynon HL, Bernstein RM, Hughes JM, So AK, et al. Polymyositis, pulmonary fibrosis and autoantibodies to aminoacyl-tRNA synthetase enzymes. Q J Med 1990;77:1019-38. Mielnik P, Wiesik-Szewczyk E, Olesinska M, Chwalinska-Sadowska H, Zabek J. Clinical features and prognosis of patients with idiopathic inflammatory myopathies and anti-Jo-1 antibodies. Autoimmunity 2006;39:243-7. Marie I. Morbidity and mortality in adult polymyositis and dermatomyositis. Curr Rheumatol Rep 2012;14:275-85. Aggarwal R, Cassidy E, Fertig N, Koontz DC, Lucas M, Ascherman DP, et al. Patients with non-Jo-1 anti-tRNA-synthetase autoantibodies have worse survival than Jo-1 positive patients. Ann Rheum Dis 2014;73:227-32. Marie I, Josse S, Hatron PY, Dominique S, Hachulla E, Janvresse A, et al. Interstitial lung disease in anti-Jo-1 patients with antisynthetase syndrome. Arthritis Care Res (Hoboken) 2013;65:800-8. Bohan A, Peter JB. Polymyositis and dermatomyositis ( first of two parts). N Engl J Med 1975;292:344-7. Koreeda Y, Higashimoto I, Yamamoto M, Takahashi M, Kaji K, Fujimoto M, et al. Clinical and pathological findings of interstitial lung disease patients with anti-aminoacyl-tRNA synthetase autoantibodies. Intern Med 2010;49:361-9. Selva-O'Callaghan A, Trallero-Araguás E, Martínez MA, Labrador-Horrillo M, Pinal-Fernández I, Grau-Junyent JM, et al. Inflammatory myopathy: Diagnosis and clinical course, specific clinical scenarios and new complementary tools. Expert Rev Clin Immunol 2015;11:737-47. Marie I, Hachulla E, Chérin P, Dominique S, Hatron PY, Hellot MF, et al. Interstitial lung disease in polymyositis and dermatomyositis. Arthritis Rheum 2002;47:614-22. Schmidt WA, Wetzel W, Friedländer R, Lange R, Sörensen HF, Lichey HJ, et al. Clinical and serological aspects of patients with anti-Jo-1 antibodies – An evolving spectrum of disease manifestations. Clin Rheumatol 2000;19:371-7. Stanciu R, Guiguet M, Musset L, Touitou D, Beigelman C, Rigolet A, et al. Antisynthetase syndrome with anti-Jo1 antibodies in 48 patients: Pulmonary involvement predicts disease-modifying antirheumatic drug use. J Rheumatol 2012;39:1835-9. La Corte R, Lo Mo Naco A, Locaputo A, Dolzani F, Trotta F. In patients with antisynthetase syndrome the occurrence of anti-Ro/SSA antibodies causes a more severe interstitial lung disease. Autoimmunity 2006;39:249-53. Watanabe K, Handa T, Tanizawa K, Hosono Y, Taguchi Y, Noma S, et al. Detection of antisynthetase syndrome in patients with idiopathic interstitial pneumonias. Respir Med 2011;105:1238-47. Tillie-Leblond I, Wislez M, Valeyre D, Crestani B, Rabbat A, Israel-Biet D, et al. Interstitial lung disease and anti-Jo-1 antibodies: Difference between acute and gradual onset. Thorax 2008;63:53-9. Mercer LK, Moore TL, Chinoy H, Murray AK, Vail A, Cooper RG, et al. Quantitative nailfold video capillaroscopy in patients with idiopathic inflammatory myopathy. Rheumatology (Oxford) 2010;49:1699-705. Hervier B, Masseau A, Mussini JM, Audrain M, Hamidou MA. Long-term efficacy of mycophenolate mofetil in a case of refractory antisynthetase syndrome. Joint Bone Spine 2009;76:575-6. Marie I, Dominique S, Janvresse A, Levesque H, Menard JF. Rituximab therapy for refractory interstitial lung disease related to antisynthetase syndrome. Respir Med 2012;106:581-7. Brulhart L, Waldburger JM, Gabay C. Rituximab in the treatment of antisynthetase syndrome. Ann Rheum Dis 2006;65:974-5. Sem M, Molberg O, Lund MB, Gran JT. Rituximab treatment of the anti-synthetase syndrome: A retrospective case series. Rheumatology (Oxford) 2009;48:968-71.